Modern citrus fruits, according to genetic analysis, are complex hybrids arising from mandarin, pummelo, citron and pepeda ancestors, refined by more than four thousand years of cultivation. The grapefruit was first identified in Barbados, and resulted from an accidental cross between Sweet Orange and Pummelo. 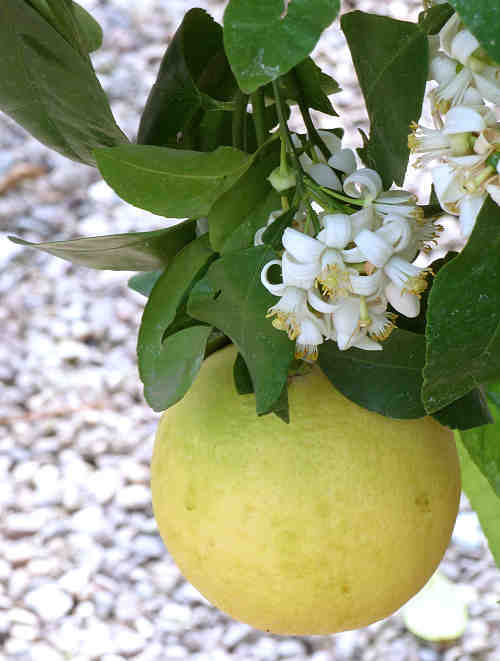 Many cultivars, and hybrids of grapefruit with other citrus, are now available. Mature Size: 15-20' high and as wide. Flowers: White, four petals, fragrant. Years before fruiting: 3 for grafted trees, 10 for those grown from seed. Fruit: Round to oval, a thick yellow rind, with flesh that can be white, pink or red, aromatic, and slightly bitter. The red fleshed cultivars tend to be sweeter. Months for fruit to ripen: 10. Storage after harvest: Up to one week at room temperature or several weeks refrigerated. Leaves: Glossy dark green, lance-shaped, smooth margins. Stems: There are short thorns on the twigs. The bark is prone to sunscald if not shaded by the leaves, especially in higher temperatures. Roots: Usually grafted onto a special rootstock that is pest resistant and adapted to the local climate. 'Rio Red' - Sweet red flesh, few seeds. 'Oro Blanco' - Sweet yellow flesh, few seeds, easy to peel, a hybrid of grapefruit and pummelo. Toxic / Danger: Possible thorns. Grapefruit can interact with many medications, including chemotherapy, making them more, or less, effective and throwing off the prescribed dose. Origin: A natural hybrid first recognized in Barbados. USDA hardiness zones: 9-11. Somewhat less cold-hardy than oranges. Drought tolerant: Depends on the rootstock. Drought will damage the fruit crop. Water after becoming established: Deeply, monthly in winter to weekly in summer, from the trunk to just beyond the canopy. Grapefruit trees require 20% more water than orange trees of the same size. Young trees need watering more often than older trees even though older trees consume more water. A sign of insufficient water is the leaves turning dull and curling inward from the edges. Fertilize: Do not fertilize the first two years. Apply an organic fertilizer every month from mid-February to early October. Apply citrus micronutrients three times a year, in February, May and August. Do not fertilize after October to keep the plant from producing new growth that will be harmed by early frost. Mulch: Keep all mulches 1' away from the base of the trunk. Keep grasses and vegetation 3' away from bud union on trunk. Planting: Place the root ball so that it is slightly higher than the surrounding soil and not at the bottom of a large basin that will cause overly wet soil during rains and subsequent root rot. Prune: Remove sprouts growing on the trunk under the bud union as they occur because these are from the wrong plant. Remove dead, damaged, crossing and weak branches in late winter. When shaping into a tree, unshaded trunks and branches should be painted with a tree trunk paint to protect against sunscald. The fruit and flowers pictured are 'Oro Blanco'.